Michael Rapport’s 2011 documentary, Beats, Rhymes & Life: The Travels of a Tribe Called Quest, laid bare some of the long-simmering tensions within the group, especially between Q-Tip and Phife. One came away from it with the glum thought that Tribe would only exist as a memory — despite all its members being alive — but then a few weeks ago, Jimmy Fallon announced that the crew was getting back together to perform on The Tonight Show. What occasioned the brief reunion is the 25th anniversary of Tribe’s magnum opus, People’s Instinctive Travels and the Paths of Rhythm. There’s at least two releases commemorating the album: a remastered CD with three new remixes and a boxset which splits the LP into eight different 7-inch singles, complete with a custom carrying case wrapped by the original artwork. By hip-hop standards, it’s a lavish treatment (though one that’s increasingly common) and this isn’t even for the group’s best or second-best album. However, whilePeople’s Instinctive Travels (PIT) may not be as sublimely conceived or executed as the Low End Theory or Midnight Marauders, it remains one the group’s most influential albums in how it defined the sound of the Native Tongues Family. 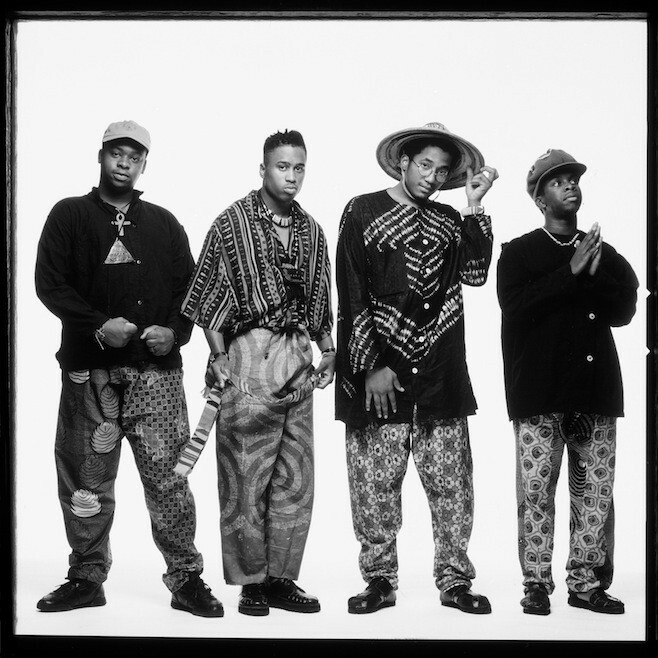 The Jungle Brothers introduced the Native Tongues concept with 1988’sStraight Out the Jungle while a year later, De La Soul’s dizzying 3 Ft. High and Rising lofted the Family’s creative ceiling. However, it wasn’t until PIT that a recognizable sonic signature for Native Tongues began to cohere around a jazz and soul-sourced vibe that felt like the birth of a new sonic era. Tribe, after all, opened the album with a baby’s cry. By 1990, artists like Stetsasonic and Gang Starr were already experimenting with jazz interpolations and samples but the “jazz and hip-hop” trend was still primordial. That’s why PIT felt so surprising, even revelatory. Their aesthetic, assisted by engineer Bob Power, found an ideal balance between cafe boho languor but corner cipher vigor. A song like “Push It Along,” offered punchy drums lifted from a Junior Mance cover of Sly Stone but then slipped on a mellow Grover Washington Jr. groove (itself a cover of an Idris Muhammed song). Or take the album’s most enduring hit, “Bonita Applebum.” The Roy Ayers melody is obviously central but try imagining the song without theLittle Feat drums. It might still sound the same but it wouldn’t remotely feel the same. It was all about finding the right blend of hard/soft elements. Too much of the former and it would have sounded like everyone else sampling James Brown. Too much of the latter and you got acid jazz. Maybe that’s why all the bonus remixes on the 25th anniversary album feel so anemic; they’re all lightness with not enough heft. DJ Cash Money’s legacy as a turntable heavyweight began in 1988 when he won the DMC World Supremacy battle. After effortlessly beating down the competitors, DMC banned him from entering the competition again—no one else stood a chance, they said. The same year, Cash went on to win the New Music Seminar and American Mixing Championship competitions. He remains the only DJ in the world to have held all three titles simultaneously. Applying his dexterous skills to the studio, Cash has also made a name as a diligent beat builder, putting out mixes for seminal labels such as Sleeping Bag and dropping old-school jams like Where’s the Party At? with partner MC Marvelous. Over the years, he has worked with everyone from PM Dawn and Q-Tip to Busta Rhymes and the Roots. His underground mixtapes have been sought after amongst the b-boy community, especially cult mixes like his WKIS-FM (a fantasy radio show) and his Old School Need Ta Learn-O – Plot I and II, which have sold out and have been rereleased time and time again. Still active on the global club and festival circuits, Cash currently hosts a regular night in Manhattan called “The Get Down,” where he drops not hip-hop jams but hot funk nuggets alongside pal Rich Medina. His mixtape Head Bangin’ Funk 45s started life as a promo for the night and features a fat stack of grooves from the likes of James Brown, Jean Knight, Ohio Players, Rick James, Dennis Coffey, Cymande, Betty Wright, Marva Whitney, Ike and Tina Turner, Pure Pleasure, and Gil Scott-Heron—all cut and blended to perfection by one of the world’s finest turntable craftsmen.